Manzano Mountain Retreat has a wide range of recreational and organized activities for you and your group. With an Olympic sized swimming pool, a full size gym, indoor and outdoor basketball courts, fishing pond, and access to miles of trail, you will never run out of things to do at Manzano Mountain Retreat and Event Center located outside Albuquerque, New Mexico. Our team building and sports training activities are perfect complete that package making MMR a perfect setting for corporate retreats, for camps as well as family Reunions. Our exceptional training facility has been host to such well-known soccer camps as the Winning Mood Dutch Soccer Camp and the New Mexico Olympic Development Program. MMR has also been the training facility of several high school football teams, UNM athletic teams including Coach Fran Fraschilla’s Men’s Lobo Basketball Team and coaching staff, as well as Tom Jager’s Gold Medal Swim Camp. Manzano Mountain Retreat makes family reunions easy and fun! All facilities are available to use on your own, or you can hire one of their event coordinators to organize a mini-Olympics with fun and amusing events right down to a torchbearer running through the camp in a toga outfit. Choose wild and educational kid activities, organize field trips to nearby Indian ruins, transport groups to real small town rodeos, organize horse trail rides, invite Native American storytellers to campfires, and musicians to the dance hall. They can also “recruit” your groups into water balloon or tug-of-war armies. The low and high ropes courses can create closer family ties through team building exercises. You might think your family would love to just lounge by the pool, but they can change all that. Football, Soccer, Bands, Cheer Leading, etc. Human Resource directors love Manzano Mountain Retreat for the elements that produce cohesiveness in groups while focusing attention on important and valuable learning experiences. You can enhance your corporate retreats with team building exercises, interactive workshops on stress, anger and time management, a game of softball or horseshoes, or beautiful mountain hikes. Click here to view more information on Team Building. Manazano mountain Retreat offers the perfect setting for retreat groups. It is nestled among the beautiful Ponderosa Pines of the Cibola National Forest just one hour from Albuquerque, New Mexico. Over night facilities can accommodate 20 to 200 people, with maximum occupancy of 200. Mazano Mountain Retreat has served day picnics and weddings as large as 500 people. With the majestic, New Mexico, Manzano Mountains for a backdrop, your group will surely enjoy their Manzano Mountain Retreat experience! Activity Hall with big screen TV/VCR, ping pong, arts and crafts, or meetings. Whether it is corporate or sports related, our team building experts will help your group develop trust, self-confidence and respect for each other. The Manzano Mountains provide the perfect backdrop for open communication, creative thinking, and strategic planning. We can help you custom design a training program just for your group. 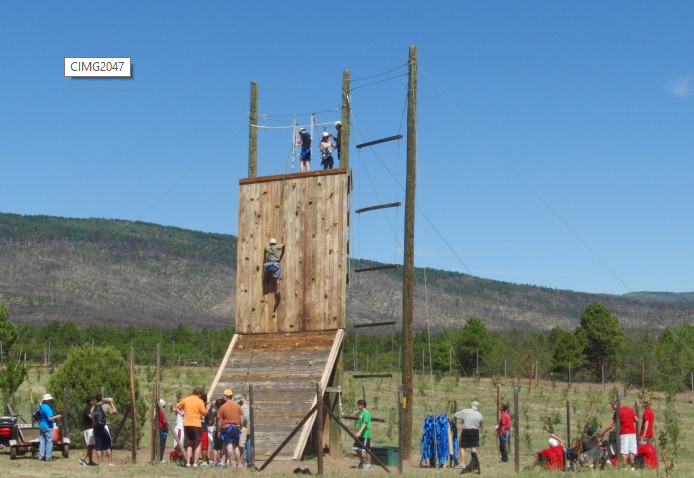 The Manzano Mountain Retreat Ropes Course was constructed by Adventure Experiences of Trinity,Texas. It is annually inspected by that company. Manzano Mountain Retreat has nationally certified and fully insured ropes course facilitators, making it one of the few facilities in New Mexico that has received accredition of its facility and its ropes course by the American Camping Association. Low Elements & Low Ropes are perfect for getting groups to work together and opening lines of communication. 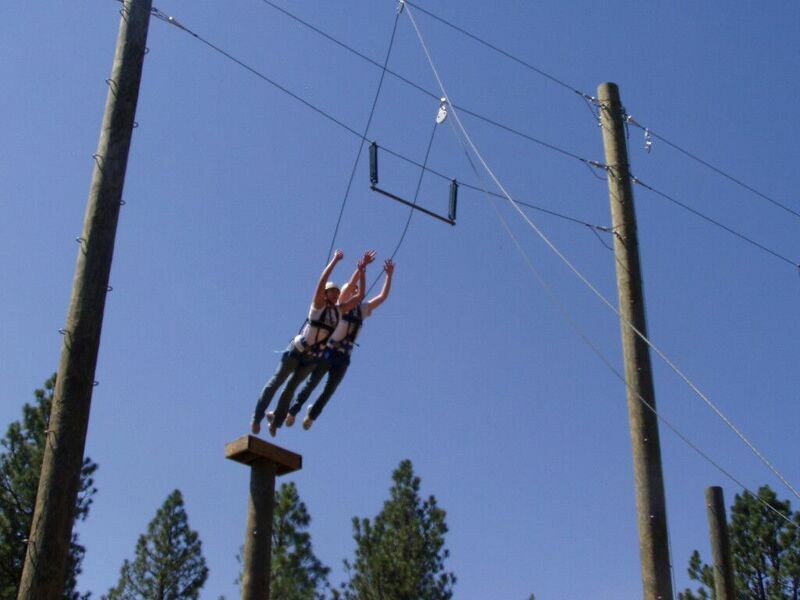 High Elements & High Ropes build self-confidence and opens one’s heart and mind. Whether you are a dedicated athlete or determined coach, you can find no better athletic training facility than Manzano Mountain Retreat. Located at an elevation of 7,000 feet on the side of the Manzano Mountains, the retreat has immediate access to over 20 miles of logging roads on which to run or hike. The 100 x 80 yard grass playing field is excellent for football teams, soccer teams, marching bands and cheer leading groups. Our 4000 sq. ft. gymnasium with state-of-the-art cushioned hard wood floor can host high school and college basketball teams or dance groups. The six-lane, 25 yard competitive swimming pool with diving blocks and wave-suppressant lane lines has been used by Olympic Gold Medallists. Our exceptional training facility has been host to such well-known soccer camps as the Winning Mood Dutch Soccer Camp and the New Mexico. Olympic Development Program. MMR has also been the training facility of several high school football teams, UNM athletic teams including Coach Fran Fraschilla’s Men’s Lobo Basketball Team and coaching staff, as well as Tom Jager’s Gold Medal Swim Camp.